Falls Church, VA - Quinn's Auction Galleries and its subsidiary Waverly Rare Books & Prints will host a July 26 Fine Art Prints, Posters, and Works on Paper sale at the company’s Falls Church, Virginia gallery. The 458-lot evening auction will commence at 6 p.m. Eastern time, with absentee and Internet live bidding available through LiveAuctioneers or Invaluable. Leading the selection is Marc Chagall’s (French/Russian, 1887-1985) color lithograph on Arches paper titled Avenue de la Victoire, Nice. It measures 24½ by 18 1/8 inches (sight), is artist-signed in pencil and numbered 59/150 from the 1967 Charles Sorlier edition “Nice and the Cote d’Azur.” This very rare lithograph is expected to bring an auction price of $10,000-$15,000. A circa-1951/55 etching and aquatint by Aaron Douglas (American, 1899-1979) titled Three Trees (Vineyard Haven) depicts a gentle waterside setting at a Martha’s Vineyard (Mass.) community long favored by African-American artists who vacationed there. The atmospheric work captures the trio of trees swaying in the wind amid distinctive island vegetation. Measuring 6¼ by 10 inches (full sheet), it will be offered at auction at Quinn’s for only the second time in 60+ years. Estimate: $4,000-$6,000. There are two monotypes in the sale by Washington, D.C.-area favorite Sam Gilliam (b. 1933-). A Fog in the Hollow, 1974, is signed and dated in pencil and measures 32½ by 45 inches, framed. Peter’s Tweeter, a 1974 serigraph and string in colors on rag paper is also pencil-signed and dated by the artist, measuring 28¾ by 39 inches, framed. The works will be auctioned consecutively, each with a $3,000-$5,000 estimate. One of the greatest of all nature photographers, Ansel Adams (American, 1902-1984) is represented in the auction by a 1947 gelatin silver print titled Fresh Snow, Yosemite Valley, California. An un-editioned press photograph, it was used in promotional material for “Ansel Adams and the West,” a Museum of Modern Art (NYC) exhibition that ran in September and October of 1979. It comes with the original press release and advance fact sheet from the show and is estimated at $3,000-$5,000. More modestly estimated but no less desirable, a devilish 1906 Leonetto Cappiello (French, 1875-1942) lithographed poster advertising the absinthe aperitif “Maurin Quina” was printed by P. Vercasson, Rue de Lancry, Paris, and is reasonably estimated at $800-$1,200. Another fine choice for new to intermediate collectors, or those who simply want an artistic splash of color for their walls, is Graham Sutherland’s (British, 1903-1980) vibrant travel poster designed in 1964 for the Cote d’Azur Alpes Maritimes Affiche. Originally aimed at the German market, its imagery and message promote travel to France’s Cote d’Azur. Estimate: $300-$500. The sale includes original drawings, watercolors and mixed-media pieces by many other artists favored by collectors but too numerous to mention, including Dali, Toulouse-Lautrec, Whistler, and Rockwell Kent. Additionally, there are more than a dozen 20th-century self-portraits by such artists as Knaths, Martin Lewis, Isaac Friedlander and Prentiss Taylor. 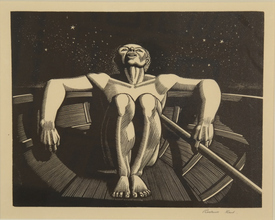 Quinn’s Thursday, July 26, 2018 Modern Prints, Poster & Works on Paper gallery auction will commence at 6 p.m. Eastern Time. All remote forms of bidding will also be available, including absentee, phone and live via the Internet through LiveAuctioneers.com or Invaluable.com. For additional information on any item in the auction, call 703-532-5632, ext. 575; or email waverly@quinnsauction.com. Quinn’s is located at 360 S. Washington St., Falls Church, VA 22046. Online: www.quinnsauction.com.